Spain will elect a new lower and upper house on 20 November, four months before the end of the current four-year parliamentary term. Prime Minister Jose Luis Rodriguez Zapatero called the election amid concerns over the economy. His Spanish Socialist Workers' Party faces a strong challenge from the centre-right Popular Party. Why call an early election? On 29 July, Mr Zapatero, who is not standing for re-election, said the time to call an election had come because the foundations for an economic recovery had been laid. The opposition had long demanded an early vote and received an additional boost when the Socialists lost local polls in May. Business leaders were also reported to have put pressure on Mr Zapatero to take decisions to restore confidence. 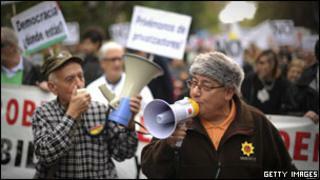 For the past two decades, the main rivals in Spanish national politics have been the Socialists and the Popular Party. They have either governed alone or with the support of smaller parties. The Popular Party came to power in 1996 but lost to the Socialists in 2004. The leading contenders for prime minister in the forthcoming elections are former Socialist Interior Minister Alfredo Perez Rubalcaba and Popular Party leader Mariano Rajoy Brey. With growth grinding to a halt and unemployment rising to a 15-year high in the third quarter of 2011, the economy is at the heart of the election campaign. There are also continuing concerns over Spain's sovereign debt. In a televised debate on 8 November, Mr Rubalcaba accused Mr Rajoy of having secret plans for massive cuts and privatisation. Mr Rajoy pointed out that the unemployment rate had risen to 21.5% under a Socialist government. Polls conducted in the first half of November have consistently suggested the Popular Party will win more than 45% of the vote, some 15% ahead of the Socialists. On this basis, the opposition party would gain an absolute majority in the 350-member Congress of Deputies and among the 208 elected senators. Polls carried out among television viewers found that Mr Rajoy had won the debate with Mr Rubalcaba on 8 November by some 6%. How big a factor is Eta's cease-fire? On 20 October, the Basque separatist organisation Eta declared "the definitive cessation of its armed activity". Mr Zapatero hailed a "victory for democracy, law and reason", but the development has not given his party any decisive electoral boost. Socialist ministers have said that it will be for the next government to deal with the new situation in a spirit of consensus. The Popular Party has ruled out any negotiations with Eta if it gains power. According to the Spanish daily newspaper El Pais, "Spaniards have come to understand that... terrorism is an issue unrelated to any party-political interests".